Ohrid is becoming a hotspot European destination for each season and several world-known medias has recommend the picturesque city. 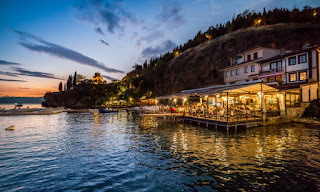 This time the prestigious media “The Guardian” has listed Ohrid among best city breaks in Europe for late summer. Ohrid is landlocked Macedonia’s “seaside” city. The old town tumbles down the hill to the banks of Lake Ohrid, with its boardwalk and beaches. The cobbled streets are crammed with churches and traditional houses, and the hill is crowned by the ruined Samuil Fortress. Other architectural sights include a 2,000-year-old amphitheatre and the photogenic 13th-century St Jovan Kaneo church perched on a cliff overlooking the lake. After exploring the town and lakeside, take a boat trip to St Naum monastery and the nearby springs; go diving at the Bay of Bones, an underwater archaeological site; or trek in the mountains of the Galičica national park. Back in town, the terrace at Letna Bavča Kaneo is a good place to try fried plasnica (small fish eaten whole, like whitebait). For drinks, there are beach bars, including Ovreche and Cuba Libre, and and grungier late-night joints such as the Jazz Inn. Read here the full article!